I have been to Kingyo before and have enjoyed my times their but haven’t written about it. I have always been a fan of the Guu group of izakayas, but with my sister in town I thought we should shake things up and head to Kingyo instead. 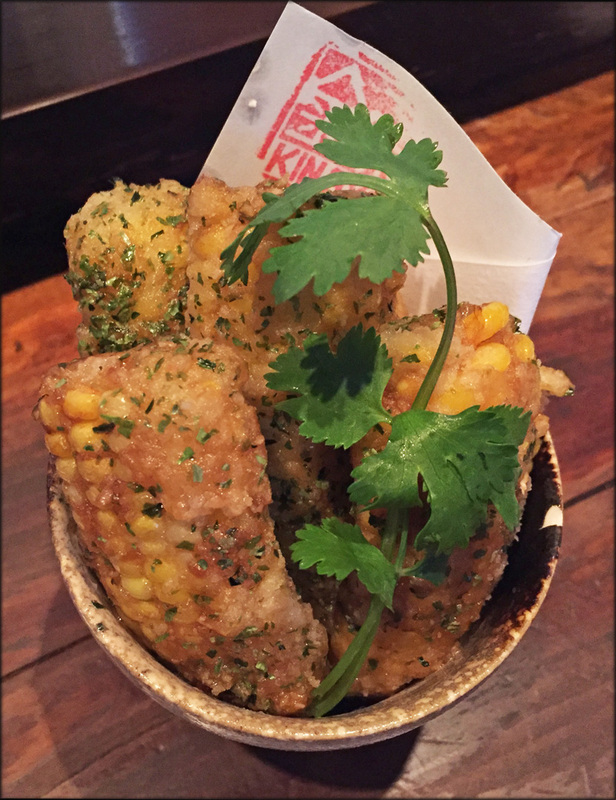 I guess in retrospect deep-fried corn was not the most optimal choice for nutritious plants based eats. In theory this item should have been a contrast of sweet and salty but the corn was not great. Each nib was dull and bland; the dish was overwhelmed by the soy butter flavour. If a cob of prime sweet young corn was used instead, I could see this appetizer being fantastic. 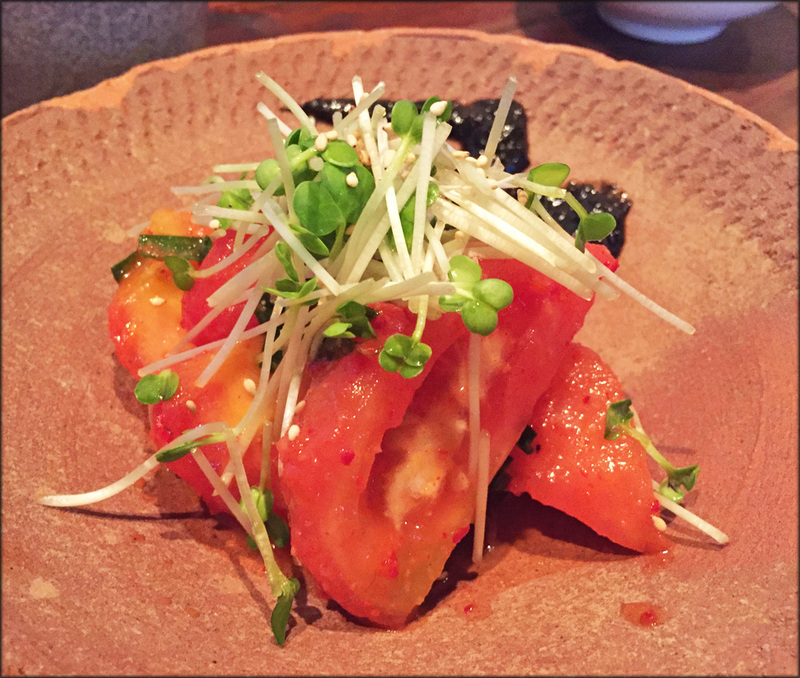 On the other hand, our order of Tomato kimchi was awesome. Savoury, tangy and refreshing this side dish was a winner. It was great to have these tomatoes on hand to clean our palates after eating the heavier pork cheek and ebi mayo. There’s a lot going on with the Sockeye Salmon Carpaccio and that had me concerned that the kitchen was trying to do much. However everything worked out but the star was the green pesto sauce. It’s light herby taste was a nice counterpoint against the garlic chips, onions, and salty ikura. 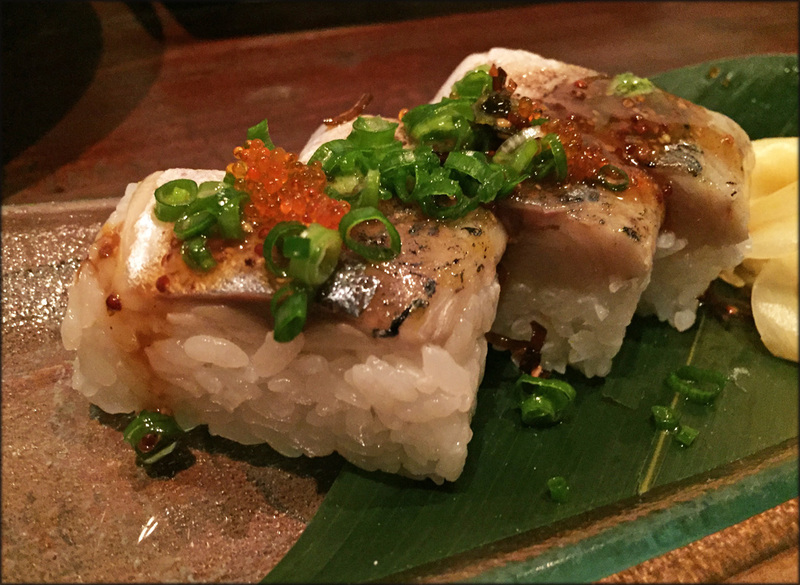 Lots of izakaya offer pressed Saba sushi and Kingyo’s version is excellent. It was well constructed, allowing the diner to easily pick each piece. The oily seared mackerel is paired with a mustard soy and green onion sauce that helped balance the strong taste of the fish. In my opinion, both raw items showed a thoughtfulness and understanding of the ingredients being used. 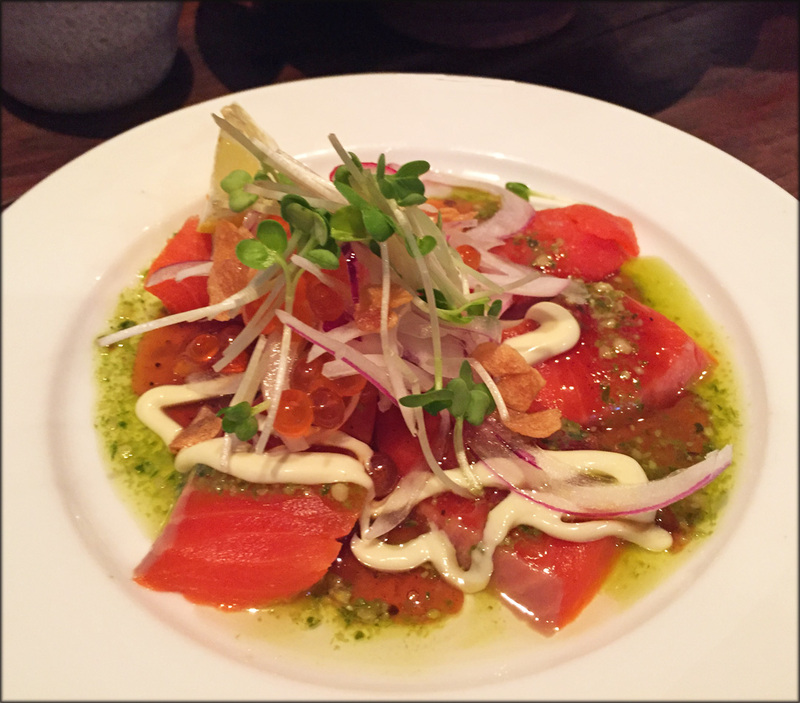 As a result, the salmon and Saba contained strong flavours that were still harmonious of each other. I love the unique texture of pork cheek. It’s got a crunchy, snappiness to it that other cuts of pork do not have. When ever its available, it’s a must order for me and Kingyo’s grilled version was solid. 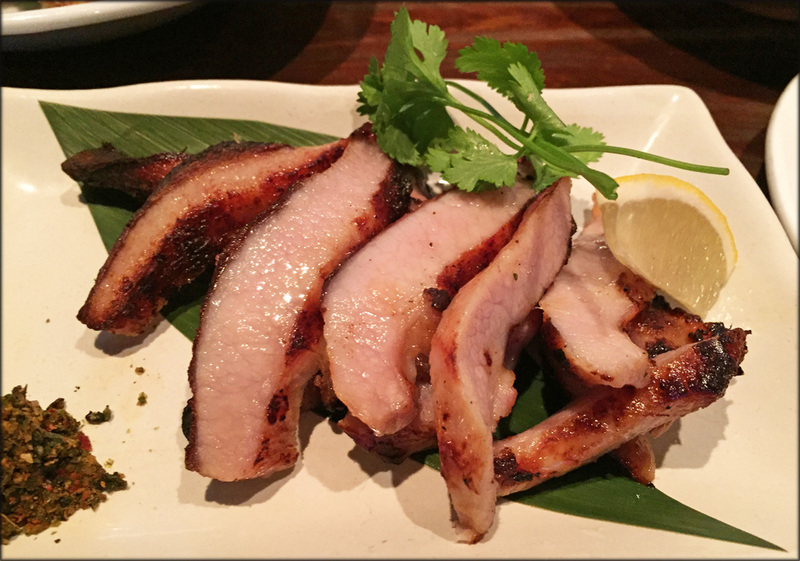 Marinated well and still moist (look at the sheen), the grilled pork cheek was a tasty and simple meat dish. 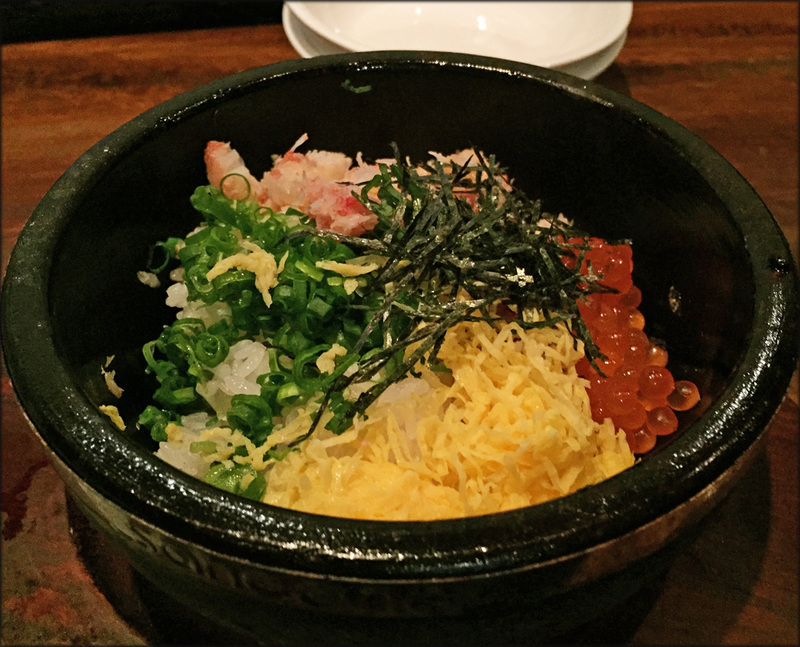 The Kani Meshi was off the daily specials menu but it was a well prepared dolsot bibimbap featuring shredded Snow Crab. 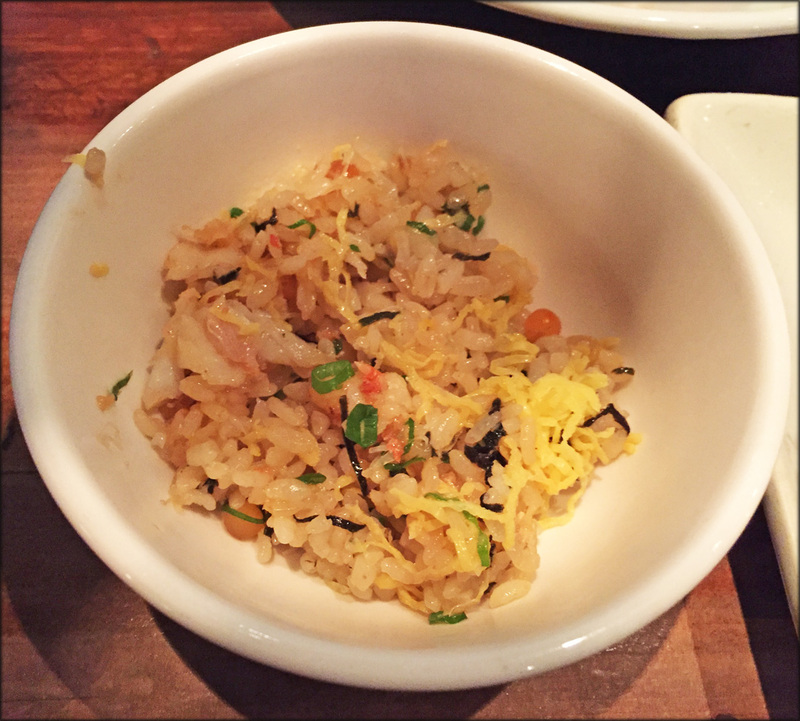 The rice had some nuttiness from being crisped in the hot stone bowl. Each bite had tastes of sweet from the crab, brininess from the ikura and a zing from the green onions. This was a great rice dish. 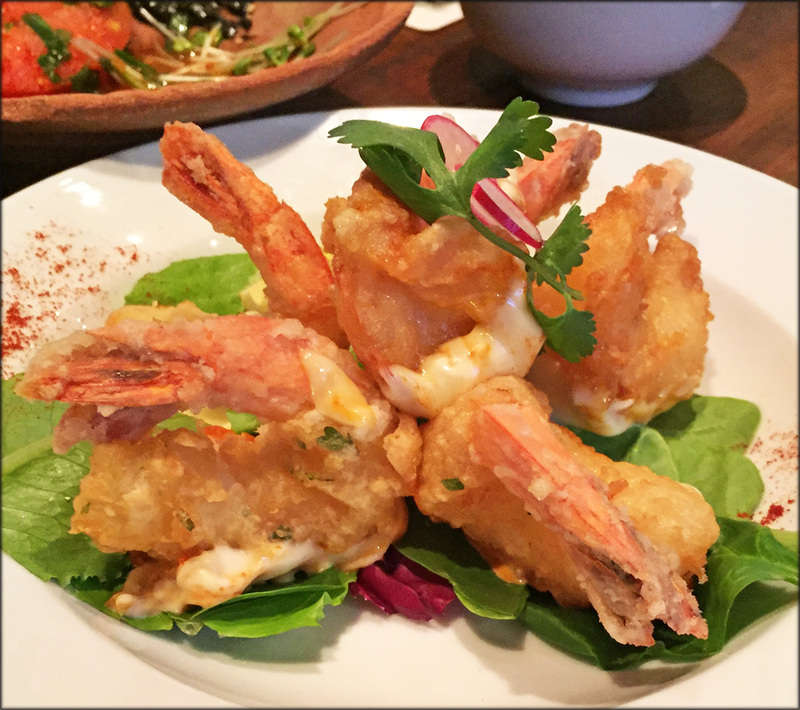 The only dish I thought could be improved and where the Guus have a slight upper hand is the Ebi Mayo. The large Black Tiger prawns were still firm and snappy. However the tempura batter was not as crunchy as I would of like. In the end, Kingyo is an izakaya that serves Japanese bar food, so I’m hesitant to call what they are serving refined or sophisticated. However there definitely is a higher level of quality present in the dishes, in both composition and preparation. Other than the deep-fry dishes, the items I tried were flavourful and balanced. This meal at Kingyo has persuaded me to visit more often. Funny how some places just can't quite get a handle on deep fried stuff. I've always thought it was more complicated than it seems.